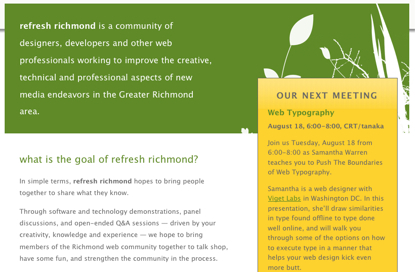 Samantha visits her hometown next Tuesday to speak about web typography at Refresh Richmond. Her presentation compares offline typography to online web type and encourages designers to "get stoked" on current and future web type possibilities. The event runs from 6pm to 8pm at the offices of CRT/tanaka in Richmond, VA. Check out the Refresh Richmond web site for more information.